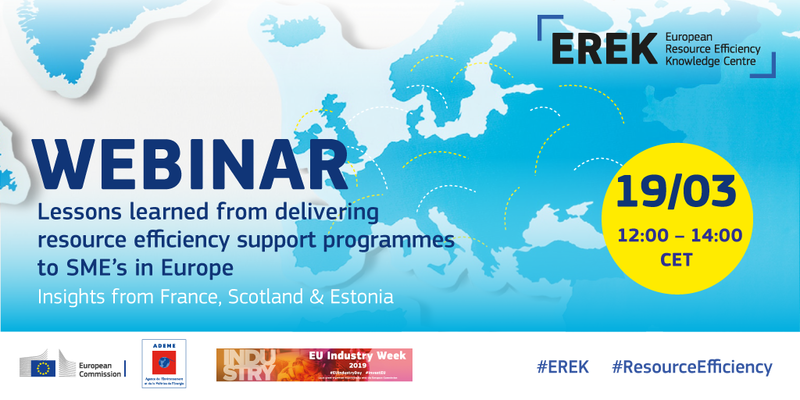 EREK will hold its first webinar on 19th March 2019 (12:00 - 14:00 CET). The event will be co-organised by ADEME and will focus on the lessons learned from delivering resource efficiency support programmes in Europe. It will focus on the cases of France, Scotland, and Estonia, with speakers from those countries. Build capacity in resource efficiency, share knowledge and experience on implementing programmes related to resource efficiency and achieving resource- and associated financial savings in SMEs, and learn from each other. To enable networking and engage business support intermediaries from France and other countries into EREK and related resource efficiency activities. To raise awareness among French business support intermediaries and SMEs from various sectors with regards to resource efficiency initiatives and measures. To bring together different private consultants, chambers of commerce and industry, SMEs support intermediaries and policymakers with responsibilities for resource efficiency and SMEs competitiveness. The workshop will be co-hosted by Ademe.